Last weekend I took my son to Star Wars Celebration Orlando 2017 (#SWCO) and we had a blast. To say that it was nirvana for a six-year old Star Wars fan would be an understatement. I’m 43 years old and was awestruck for most of the day. There were thousands of fans – hundreds of them in costume – and every single one was gracious and kind and polite and considerate, even the ones dressed as Darth Vader or Emperor Palpatine. I saw grown men weeping when the trailer for The Last Jedi was shown and I saw dozens and dozens of little kids, boys and girls, going gaga over the bounty of toys and games and interactive experiences on display. Of all the awesome things to see, though, I think the one that really blew me away was at a tiny little booth manned by a solo well-dressed man representing an Italian model company. He was advertising only two products. One was an unimaginably-detailed Millennium Falcon model about the size of a coffee table. I am a huge fan of the Falcon and have about a dozen models of it in varying sizes, so I stopped to take a look because this one was crazy cool. It’s huge, though, and I (sadly) cannot imagine any place where I’d ever be able to put it in my house. It’s also expensive. The company sends you the parts in little kits over the course of 25 months, at $64.99/mo. As much as I love a good Corellian freighter model, I don’t know if I could handle spending over $1,600.00 and two years to build one. The other product was an R2-D2 model. It was exactly one-half the size of the “real” astromech droid, but otherwise exactly the same. While my son kept trying to wander off to look at some replica blasters in the next booth and I was talking to the guy about the Falcon model, the R2 swiveled its head and looked at me. I caught it out of the corner of my eye and my jaw dropped. The guy laughed and I stared at the little droid. I had thought it was just a model, like the Falcon one. Boy, was I wrong. 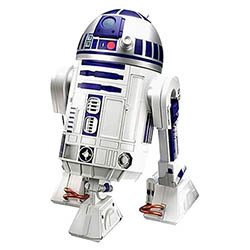 For the same $64.99/mo for 25 months, you can get an actual, working, m-f’ing R2-D2. I am not kidding. This thing is incredible. Its LEDs blink just like in the movie. Its head swivels and it responds to voice commands and can roam around your house in autonomous AI mode. It has a lightsaber that will pop up from its dome and little robotic hands that can extend from the metallic-blue strips to connect to Cloud City’s computer network. It has a projector! It connects to your home’s WiFi network and you can control it with your smartphone. I mean … COME ON. You really need to visit the official website to read all of the details because I can’t do it justice here. I’m not afraid to admit that I spent most of the first dozen years of my life assuming that by the time I was an adult we would have jet-packs, flying cars, lightsabers, and intelligent servant droids. I’ve sort of given up hope that I’ll see any of those things in my lifetime, but I really do believe now that my children will live to see a world with real robots. And, yes, I know that this is “just” a toy. But we are close. And that’s amazing.